Have you been injured by a distracted driver while driving on an Arizona highway? Arizona ranked as the 44th least safe state in a State-by-State Report made available by the National Highway Safety Counsel, which graded states on actions and policies they have taken to reduce the risk of preventable deaths to residents. Amongst Arizona’s shortcomings is its substandard road safety actions. For instance, Arizona does not have a total cell phone ban on teens and novice drivers, nor does Arizona have a texting ban for all drivers. And so, many drivers on Arizona highways are distracted. Distracted driving is a leading cause of preventable accidents in Arizona and is a cause for preventable death. While Arizona may not have traffic regulations that do enough to curtail distracted driving, people harmed and who have been injured by a distracted driver may file a claim against the distracted driver for financial compensation for damages, such as medical expenses, wage loss, pain and suffering and more. 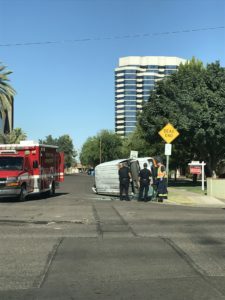 Arizona Accident Lawyer Randal Hutson is an experienced Phoenix attorney who proudly represents people who have been injured in auto accidents through no fault of their own. By holding distracted drivers accountable for the injuries they cause to Mr. Hutson’s clients, there is an incentive for road safety throughout the Arizona to improve. Randal Hutson is a proud member of Arizona Association of Justice, which is Advancing Justice for the Injured and Protecting their Rights. Mr. Hutson is sympathetic towards accident victims and recognizes that big insurance companies and big businesses do not treat unrepresented injured people fairly in the claims process and grossly take advantage of them. Randal Hutson works hard fighting to provide his clients claim to get the compensation that they are entitled to. Arizona Accident victims may be entitled to certain compensation for their injuries and other damages. They are entitled to compensation for their medical expenses, but insurance companies often argue with injured claimants that bills are unnecessary and unreasonable, not related to the subject accident, that the injured person has insurance that has paid for an expense or part of it, and that a healthcare provider simply overcharged. Randal Hutson is an experienced accident attorney and is familiar with the realities of the defense’s arguments and the proper way to go about establishing a claim for the full expenses. Arizona Accident victims are also entitled to compensation for pain and suffering. Insurance companies are very unsympathetic and would like to get away with paying virtually nothing for pain and suffering and minimize the true experiences of accident victims. Mr. Hutson can properly evaluate a claim to fairly determine the “value” of pain and suffering, which is virtually always beyond what insurance companies offer. Mr. Hutson can help you recover compensation for your medical expenses, pain and suffering, and more, if you are entitled to more. Call The Hutson Law Firm for a Free Consultation with an experienced Arizona Accident Lawyer at 623-628-7400. Do your part to help keep Arizona’s highways safe, and allow Mr. Hutson to help you receive the compensation you may be entitled to.